But unless you’re Robert Frost or Emily Dickinson then writing your own poem can be ridiculously hard! Not to mention when you do they often end up being cheesy and making you cringe. 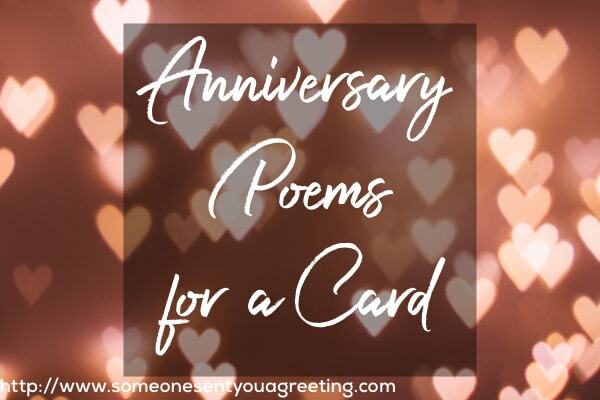 So, what could be better than a compiled list of anniversary poems for different people and occasions? Need a poem for your husband or wife, funny ones, specific anniversaries (1st, 50th etc) then read on as we’re sure you will find the perfect poem for whichever anniversary you need. These poems are perfect if you want to wish your partner or someone you know a happy anniversary. Make your card standout with a clever or touching poem. And you’ve been a world-class treat! Sending, or even reciting a poem for your husband or partner is a great way really express your feelings for them. The poems below are all written specifically for the special man in your life. If you want to add a bit extra to a bland card or really impressive your wife/partner then these poems written for her are a fantastic starting point. A touching anniversary poem will really demonstrate how much you care. Your friend, and your guide. I’ll be do anything for you. I’ll bring you the sunshine. that you and I are so lucky to share. our wildest dreams came true. My whole world is filled with pleasure. You’ve been my greatest treasure. The air seems fresher too. Seems perfect, because of you. Holding hands, makes me feel like I’m glowing. Please believe what goes on in my heart. Know that it’s true; I really love you! And I’ve loved you this way from the start. 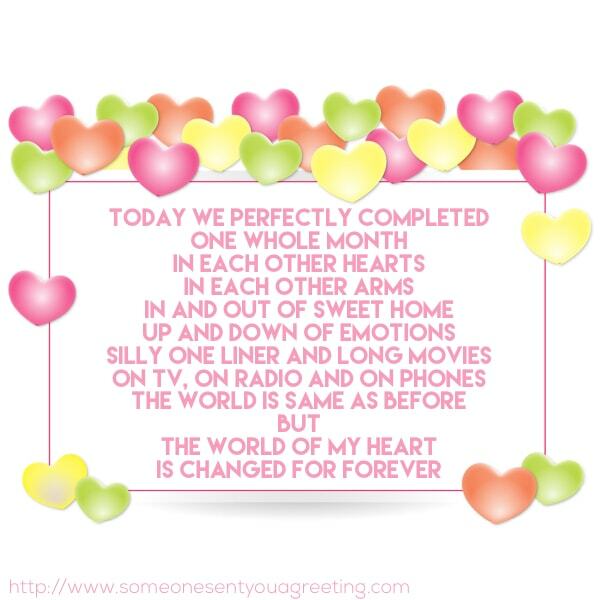 Whilst a love poem is what you might first think of for an anniversary, using a funny poem can work just as well. 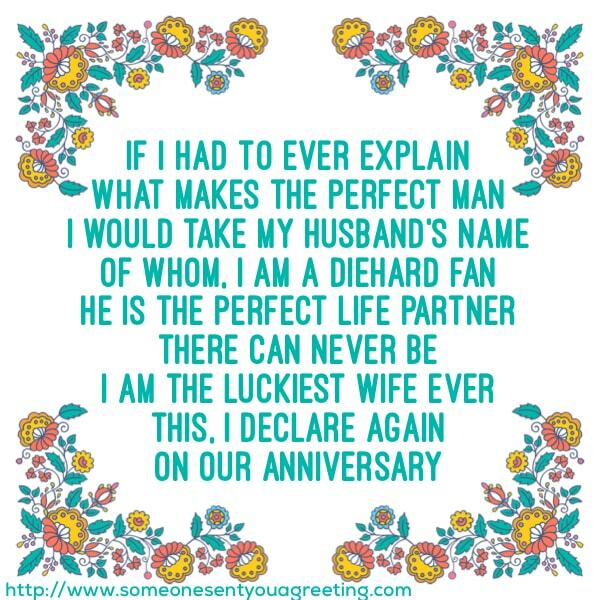 If your partner or the person the card is intended for has the right sort of humour then a funny anniversary poem could provide a good laugh. if you forgot what’s today. to list all your flaws. to a few basic laws. that you had no money. It’s just that we’re a perfect pair. Because we are a perfect set. What matter if this thought is sappy? I have to admit, you’ve changed a lot too! On the day of our anniversary. And wonder should I say Amen? A one month anniversary is right at the beginnings of a relationship when feelings are probably at their strongest. Use those and the poems below to really show what this new person in your life means to you. The 1st year anniversary of any relationship is a big moment. It’s a significant milestone and one that deserves to be celebrated and acknowledged. 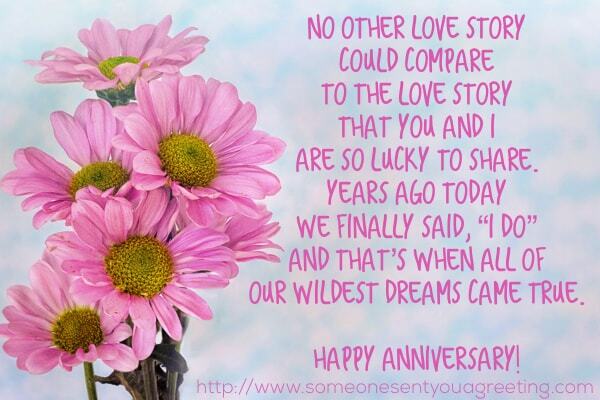 One of the best ways to do so is with a fitting anniversary poem, just like the ones below. Reaching your 50th anniversary is a huge achievement. 50 years is an incredibly long time, and what better way to celebrate with your partner than with a lovely poem to say just how much you love them. Had a milestone, turning fifty. Fifty years of sharing bed, of sharing kids, and life. let’s look ahead to fifty more!